This easily accessible Tip-Out Storage Bin with a simple Tip-Out design makes storing and retrieving items a snap. It has a steel frame with a Black Powder Coated Finish. Each of the 4 Durable Clear Plastic Trays have seven adjustable dividers to make 8 total compartments per tray. 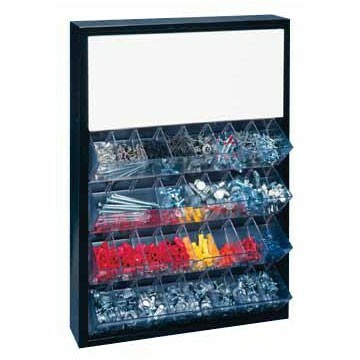 This unit also has a top storage compartment that measures 3” D x 6” H x 18” W with 2 shelves and a hinged door. Can stand on bench or wall mounted, stackable with any other Craftline Tip-Out Bin with supplied hardware.